Travel poster images of Switzerland often center on snow-crested mountain peaks, bright red cable cars, Alpine chalets and cows grazing in lush green meadows. But Switzerland is more than idyllic countryside. The cities in this centrally located European nation have their own allure and their own beautiful settings. Whether your group is interested in religious sites, art, shopping or museum-hopping, the cities of Basel, Lucerne and Zurich — all known for their cultural treasures and quality of life — offer plenty of possibilities for building irresistible itineraries. Switzerland’s fabulous rail system also gives group travel planners a lot to work with. Besides spotlighting what to see and do in three great cities, the following pages also include an itinerary for the Grand Train Tour of Switzerland. With its charming historic district, wealth of art, sacred and religious sites, museums and other cultural venues, Basel makes an ideal destination for a wide range of touring groups. Basel straddles the Rhine River, one of the continent’s great rivers and among the most important arteries in the world. Located in the heart of Europe and known for its large number of iconic modern buildings, Basel hosts world-class events, is favored with multicultural influences (Swiss, German and French) and enjoys an excellent quality of life. With 36 to 48 hours to discover Basel, your group can easily navigate between the seven city districts using public transportation, five daily 90-minute Panorama city bus tours or city maps that point out sights on a walking tour. Basel features seven stimulating city districts, including Grossbasel city center and St. Alban; Gundeldingen, Bruderholz and Dreispitz; Iselin, Gotthelf and Bachletten; St. Johann; Matthäus, Klybeck and Kleinhüningen; Kleinbasel; and Basel Nord and Riehen. Each has its own distinctive traits, and each holds a special fascination: one has a port area where three countries come together, one has the highest quality of life in the country and the other houses the popular city zoo. Basel’s Paper Mill Museum, Kunstmuseum Basel (Fine Arts Museum), Basel Toy Museum and Jean Tinguely Museum are four of the most popular museums, but they are just a few of the city’s 40 museums that house collections of international significance. You may want to begin your tour by investigating Basel’s Bruderholz quarter where impressive villas are located, as well as the industrial Dreispitz area with its Academy of Art and Design and House of Electronic Arts. Check out the Gundeldingen District with its melting pot of cultures. While in the district, stop off for lunch at Tellplatz 3, a new restaurant for people who appreciate excellent food and joie de vivre. Here you’ll find distinctive cheeses, homemade sausages, special spices and fine wines. Visit some of Basel’s most important religious sites. The red sand-stone Basel Munster, located on a hill overlooking the Rhine, is one of the city’s main attractions. It was built between 1019 and 1500 in the Gothic and Romanesque styles, and offers stunning views for those who venture up one of the towers. The Elisabethenkirche, the most renowned neo-Gothic structure in Switzerland, is located in the center of Basel next to the Basel Theater. It was the first church constructed there following the Reformation. A third church in Basel to include in your visit is the Peterskirche. This church, with its delicately arched interior pillars, features a beautiful white-and-red stone interior and many colorful murals. Some call it the “sweet spot” of Switzerland. Located on beautiful Lake Lucerne and ringed on two sides by imposing Mt. Pilatus and peaceful Mt. 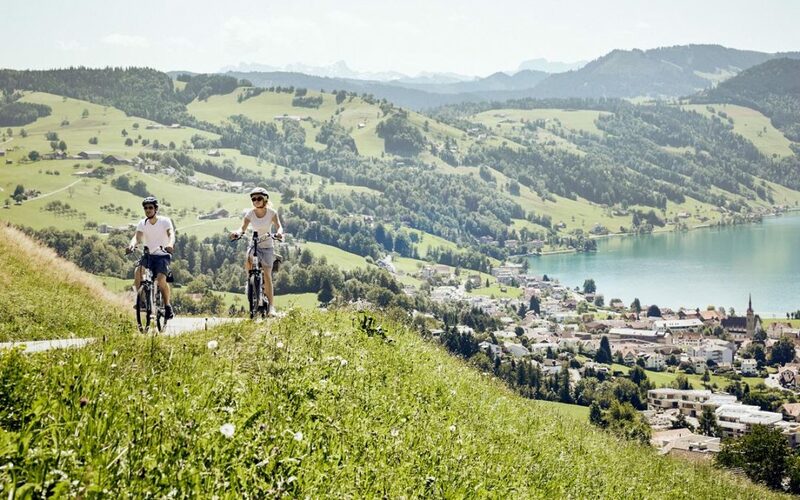 Rigi, Lucerne is centrally located, offers many attractions and is ready for visitors. 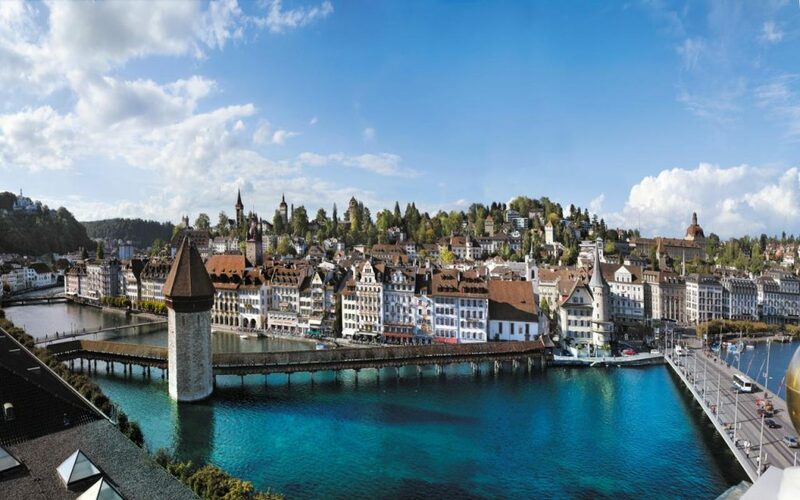 A typical day for a group might be to enjoy a tasty breakfast at your hotel, then visit the historical city center of Lucerne with its fresco-painted buildings that border the Reuss River. 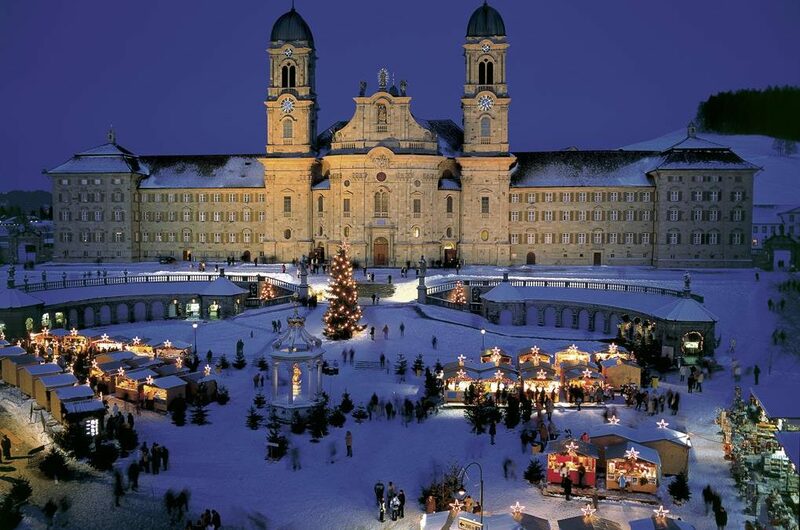 Picturesque squares here include the Weinmarkt, where citizens of the town swore an oath with other cantons years ago; Hirschenplatz square, named after an old inn from the Middle Ages; and Kornmarkt square with the Town Hall and the beautifully painted Pfistern guildhall. While in the city center, see the most ornate pulpit in Switzerland at the Franciscan church, which features typical Medieval Mendicant architecture. The church, built in the second half of the 13th century, features flag frescoes from Lucerne’s Middle Ages conquests. Taking a break for lunch, your group can enjoy a fine meal at Hotel des Balance, which offers terrific views from the hotel’s terrace overlooking the river. The hotel is centrally located and offers typical Swiss main courses and special desserts. 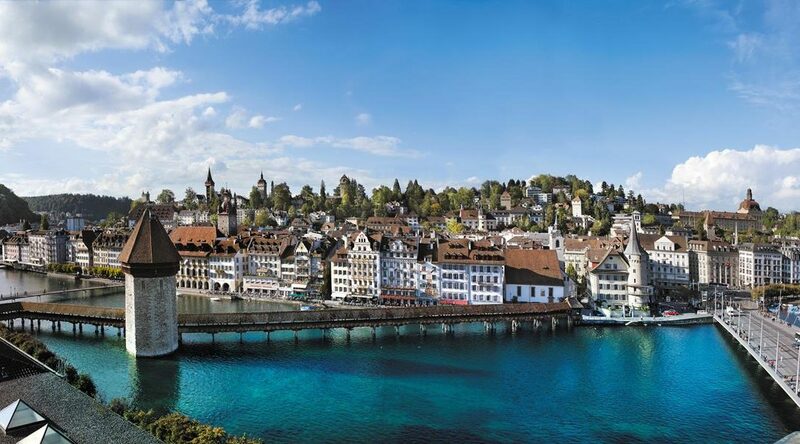 While in Lucerne, be sure to cross the famous Chapel Bridge constructed in the first half of the 14th century as part of the city’s fortifications. Paintings in the bridge’s interior corridor were added in the 17th century and illustrate scenes of Switzerland and local history, including the biographies of Lucerne’s patron saints. Next to the bridge is the Water Tower, a 111-foot-tall tower built around 1300 as part of the city’s wall. The tower is both Lucerne’s and Switzerland’s most photographed landmark. Three important Lucerne museums are the History Museum, the Museum of Art, and the Museum of Natural History. Also check out the interactive Swiss Transport Museum, the most popular museum in Switzerland, where your group can learn about Swiss road, rail, air and water transportation. Hundreds of fascinating exhibits of polished locomotives, boats and old-time airplanes and automobiles are spread throughout thousands of square feet of space. A steam-driven paddlewheel boat trip on Lake Lucerne with supper onboard will give your group spectacular views of the city and surrounding mountains. It’s a fitting end to a memorable visit. Extend your trip by taking a lake steamer to 7,000-foot Mt. Pilatus. Ancient lore says Pilatus is the maker of weather, a dragon’s lair, home to giants and the grave of rulers. Lucerne’s very own mountain, Pilatus is one of the most legendary places in central Switzerland. On a clear day the mountain offers a panoramic view of 73 Alpine peaks. Take the railway up (the steepest cog incline railway in the world at 48 percent) and the aerial cable down. An international center for banking and finance, Zurich is not all buttoned down and work-minded. The trend-setting city of 400,000 inhabitants and with more than 2,000 years of history is full of life, culture and fun. 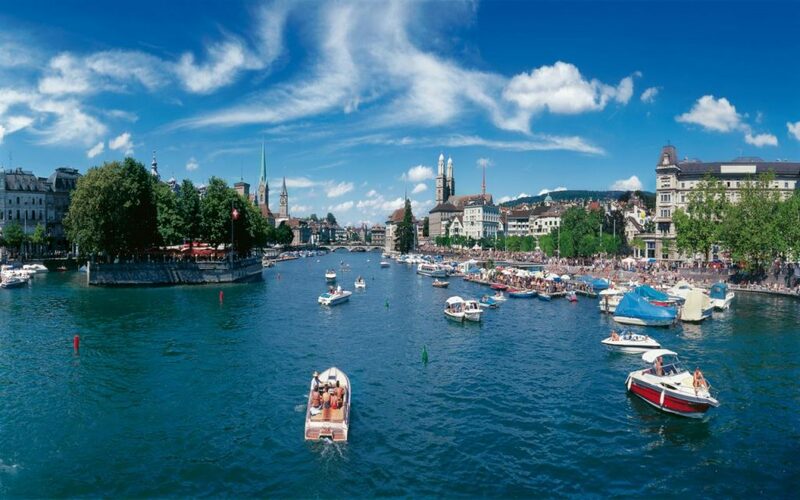 The emerald green Limmat River runs through the charming, beautifully preserved Old Town, and the towering Gothic spires of the Fraumünster and Grossmünster churches highlight the city’s rooftops. This is the birthplace of the avant-garde Dada Movement, which ran from performance art to sculpture, photography, painting and more. Take a tour of St. Peterskirche, the oldest church in Zurich, which dates from the ninth century; the church’s clock face is the largest in Europe, and it’s hard to miss. The Fraumünster, with construction beginning in 1250, has spectacular stained glass windows, with chancel windows created by early modernist Marc Chagall. If you like to bike, you can pick up a free rental bike at Zurich’s main train station, in front of the Swiss National Museum or at many other places throughout the city. Bicycle lanes are marked throughout the city; look for the bike lane signage or look at the online city map where it’s also marked. There are air pumps stationed throughout the city. A breezy boat trip on Lake Zurich is especially invigorating, as is a ride by electric tram up the wooded slopes of the nearby Uetliberg, where you can enjoy an all-encompassing view over the lake and see the magnificent Alps in the distance. At the top of Uetliberg are restaurants and a hotel. The mountain is also great for hiking, biking, picnics or paragliding. Groups up to 270 can even enjoy a luncheon or dinner in a banquet hall at the top. 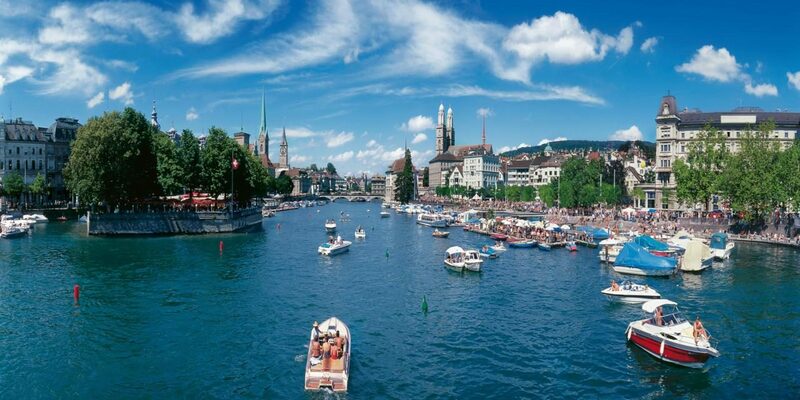 Zurich is also known for the Bahnhofstrasse, one of the most renowned shopping streets in the world. From famous department stores to upscale chocolate shops to fine jewelry and clothes from acclaimed designers, this luxury retail enclave is a highlight of any trip. Pay a visit to one of the more than 50 museums such as the Kunsthaus, one of the leading art museums in Switzerland, which houses all types of art from the 15th century up to today. Plan on celebrating in the Old Town district with its many inviting restaurants and bars. Enjoy an exquisite traditional meal such as Zurich Geschnetzeltes in one of the historic guild houses. Take in some nightlife at Mascotte, located in a century-old building with live bands, comedy and DJ nights. This area in the Niederdorf district is affectionately known as Dörfli, the “little village.” Its car-free, winding alleys reveal interesting boutiques, antiquarian bookshops and craft studios, all waiting to be discovered. 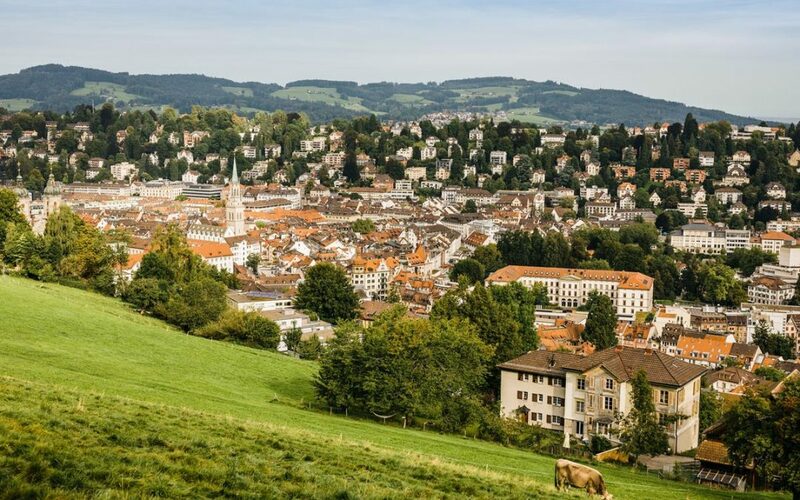 In 2019, Zurich will completely devote itself to the theme of the Reformation. It was in 1519 that Huldrych Zwingli started to reform the city through his work as pastor at the Grossmünster church. From the end of 2017, jubilee festivities will look at facts and figures relating to the Reformation in Zurich, as well as the lasting impact it had on local society.